Today, we’re thrilled to announce the release of PreForm 1.0. Shedding the _beta _suffix, as well as that pesky leading zero, PreForm 1.0 brings model preparation for the Form 1 to a new level of maturity and performance. It’s been a long time coming! This major update includes hundreds of fixes and features, along with a slick interface overhaul. 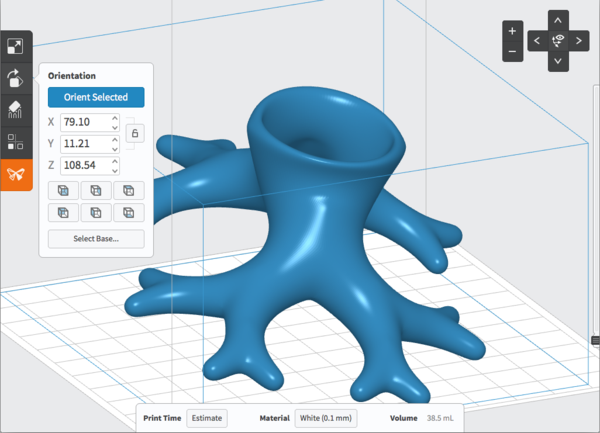 We've made substantial improvements in how your model’s supports are generated and printed. Altogether, we’re incredibly proud of PreForm’s latest incarnation. There are some real stand-out features. To make removing a freshly-printed model from the build platform easier, PreForm’s support generation algorithm now includes handy quick release tabs — small notches on the side of your model’s base that help it lift easily off the build platform. Wedging a narrow tool into the notch will give you some leverage to pop the model right off. The triangular gap between the build platform and the model's base makes it easy to get your model off the platform. PreForm 1.0 supports .OBJ files. For those of you working in SketchUp (along with a number of other CAD programs), you can now export your models directly into PreForm, without having to generate an .STL. We’ve been squashing Mac bugs since version 0.8.4, and now we’ve got the graphical interface to support it fully. We know you want to be printing, not troubleshooting our software or waiting for models to render. An under-the-hood overhaul of PreForm dramatically increases the program’s speed and versatility, while decreasing the amount of computing power it needs. We’re excited to see what you do with the newest version. Download PreForm 1.0 now and let us know what you think! We'll be updating our support site over the rest of this week — if you run into any problems or bugs, please let us know, either in the forums or by filling out a support request. If you’re in Vegas, come visit us at CES Booth 31520. We’d love to see you!